Carnegie Mellon University's National Robotics Engineering Center (NREC) and Concurrent Technologies Corporation (CTC) of Johnstown, PA, are working with the Air Force Research Laboratory and Ogden Air Logistics Center 309 AMXG to develop and demonstrate a robotic system that uses high-powered lasers to remove coatings from fighter and cargo aircraft. In a two-year project sponsored by the National Defense Center for Energy and Environment, CTC, under Prime Contract W91ZLK-10-D-0005 with NREC as a subcontractor, will build six autonomous mobile robots, each with a laser coating remover, and deploy them to work in teams to remove paint and other coatings from aircraft at Hill Air Force Base in northern Utah. 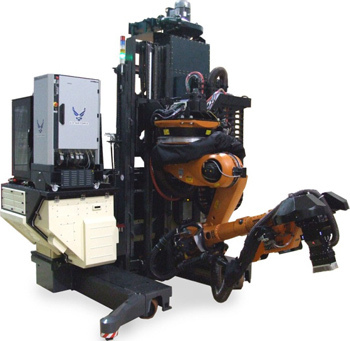 The demonstration at Hill AFB is the latest phase of development for the Advanced Robotic Laser Coating Removal System (ARLCRS). Earlier, CTC and NREC developed a prototype of the robot, which is undergoing testing at CTC's facilities. CTC's laser coating remover uses a continuous-wave laser to strip paint and other coatings from aircraft. It replaces the abrasives or chemical paint removers used in traditional coating removal processes, which generate significant hazardous wastes and air emissions. The laser can selectively remove coatings. A custom HEPA system safely collects debris as it is removed from the aircraft, minimizing its impact on the environment. The use of autonomous mobile robots developed at NREC makes it possible to automate and precisely control the stripping process, while protecting workers' eyes from hazardous laser light. The robots work in teams, with the size of each team varying based on the size of the aircraft. The robots keep the laser beam properly angled against the aircraft skin, adjusting to the shape of each area of the airframe. The robots also control the speed of the beam over the surface to ensure that it is slow enough to ensure complete stripping, but not so slow that the aircraft surface is unnecessarily heated. Paint removal is performed as part of the normal programmed depot maintenance process for aircraft. The robotic paint stripper system promises to be environmentally superior to traditional methods while simultaneously reducing processing time, decreasing workload and supporting 24/7 operations at Air Logistics Centers (ALCs). "Automated laser decoating is expected to significantly reduce labor, waste volume, environmental risk, and overall cost," said Jim Arthur, CTC principal process engineer and project manager. The autonomous mobile robots built at the NREC under the direction of Tony Stentz, principal investigator and NREC director, make extensive use of commercial, off-the-shelf parts to reduce costs, simplify maintenance, and make future upgrades easier. "A team of robots wielding laser paint strippers can work cooperatively to quickly and efficiently remove paint and coatings from aircraft," said Stuart Lawrence, the NREC program manager. 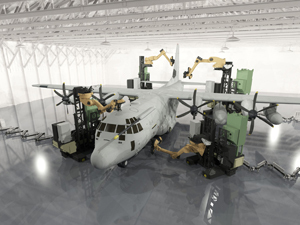 Two robots might be used for a fighter, while four robots might be used for a large cargo plane. The system generates stripping plans based on the type of aircraft and can dynamically update the plan while stripping is underway. Maintenance personnel do not need to physically mask areas that should not be stripped. The system can virtually mask these areas, causing the robot to avoid them. This saves time and manpower. The robots' advanced sensors also detect, classify, and record the condition of the aircraft surfaces as stripping proceeds. Future applications for ARLCRS could include applying paint and coatings, inspecting aircraft, and performing basic maintenance and repair tasks. The views, opinions, and/or findings contained in this report (paper) are those of the author(s) and should not be construed as an official Department of the Air Force/Army position, policy, or decision unless so designated by other official documentation.